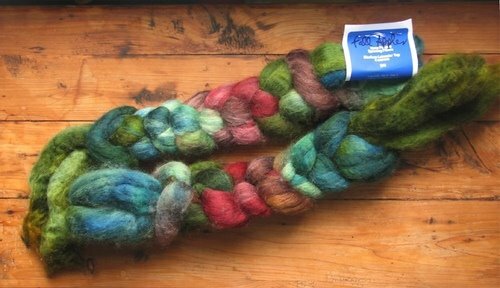 I’ve joined the Tour de Fleece (the Ravelry one, that is). 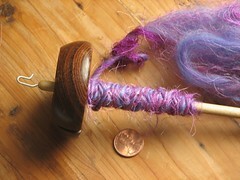 I’ve been a little lacklustre about spinning lately, but am already feeling more excited. I’m spinning a lot more on my current project already. For the challenge, I’ve decided that I’ll pull out three works in progress that I haven’t touched in months and do my best to finish all three. Then I will have more yarn and more space for more fiber! We’re putting together a “team” from String Thing, which I think will be fun: we can egg each other on. Some silk hankies I dyed last summer and started spinning last November. My hands were too dry to work with silk over the winter and then I never went back to them. 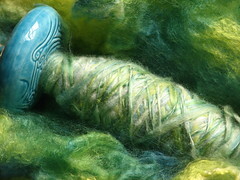 Some silk given to me by my Ravelry friend debolsillo blended with some Ashland Bay merino I bought from the Woolery. This one will be the challenge: I’m spinning it thick and even, and I’m better at thin and even. Some handpainted Blue Faced Leicester top from Three Waters Farm, which is local to me. I don’t think I’ll be spinning the rest up the way I started, so this will kind of be a new project. Thank you! I'm really loving greens in that family at the moment.